The intranasal canine Bordetella (also known as kennel cough) vaccine is a great alternative to the injectable canine Bordetella vaccine. It is given without the use of a needle and is viewed by many professionals as more effective. Remove the cap from the needle and inject a small amount of air into the sterile diluent. Draw back on the syringe to remove all of the sterile diluent. Inject the sterile diluent into the Bordetella vaccine vial and mix thoroughly. Draw back on the syringe again to remove the vaccination mixture from the vial. Be sure to remove as much of the vaccine as possible. 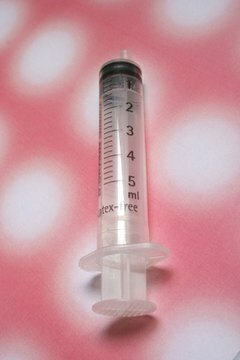 Replace the cap on the needle and twist to remove the needle from the syringe. Place the spray cap onto the end of the syringe. Twist the spray cap to secure it into place. Hold your dog by the snout and spray equal amounts of the vaccine into each nostril. Your dog will most likely sneeze some of the vaccine after it is given. It will still be effective if this occurs. Keep the vaccine cooled until it is ready to use. If the vaccine remains at room temperature for an extended period of time it will not be as effective. Use caution when working with the needle.